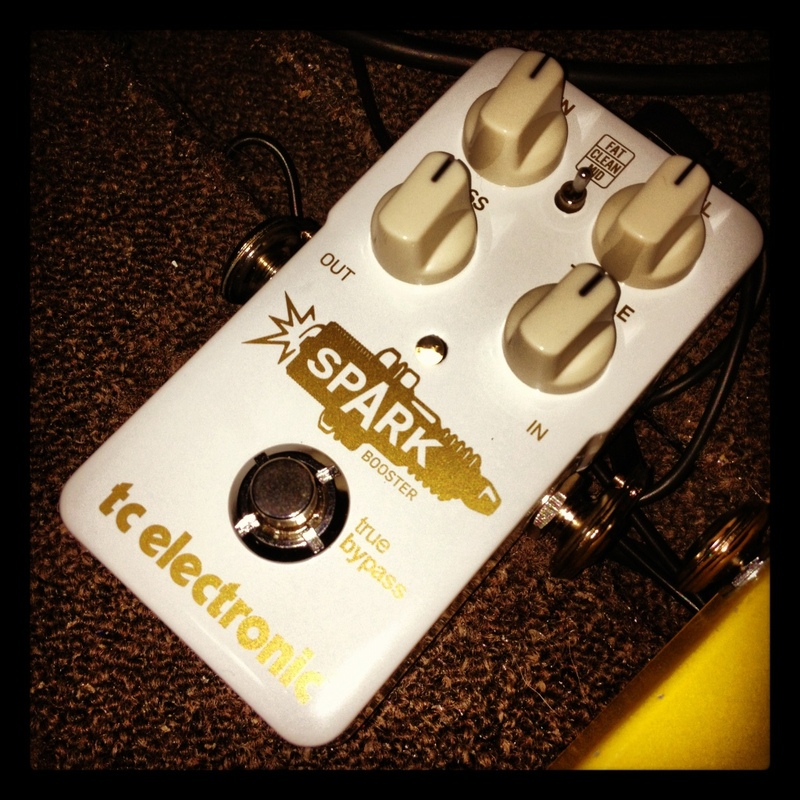 The TC Electronic Spark Booster is a versatile boost and low gain overdrive pedal. Sometimes when playing electric guitar we wish we could get a little bit “more” out of our amplifier. Valve amplifiers always seem to sound their best when running at peak volumes. Problem is many of us rarely get to run our amps at these high volumes. Other times we want to get a little boost when playing a lead break, or add a little more compression and grit to our tone. The TC Electronic Spark Booster offers all of this, and more in a compact pedal package. Boost pedals have traditionally been fairly simple affairs, with one or two controls. The Spark Booster is a much more full featured pedal, with not only output and gain controls, but also active bass and treble controls. It is capable of boosting your output by 26dB. This isn’t all though. TC Electronic have seen fit to add a three-way voicing switch, which has a standard clean boost voicing, fat and mid boost. All of this is packed into a true-bypass pedal, ensuring that you have no tonal degradation if you do choose to turn it off. I tested the Spark Booster with my Blackstar HT-5, using both the clean and dirty channels. The clean boost operates much like most clean boosts. On the clean channel of my HT-5 I got a healthy amount of volume boost as the level control was turned up. Turning the gain added a nice level of compression and grit. The Spark Booster generated a nice level of crunch that was perfect for AC/DC style rock. Switching over to the dirty channel, and the Spark Booster on the clean boost switch added extra compression and sustain as the level and gain went up. It worked beautifully for a lead boost where the tone didn’t really change, and was perfect for long, singing single notes. The bass and treble controls are great for adding or subtracting a little of each frequency band to tailor your exact sound. The Spark Booster’s fat boost pumps up the low-end, and adds a little a little more dirt than the clean boost as the gain increases . It’s perfect for fattening up clean single coil tones, and adding a little more edge to clean tones. Switch to humbuckers, max out the gain and level, roll the bass to just past 1 o’clock and the treble to about 3 o’clock, and you’ll find classic early heavy metal type tones. Lead playing on the dirty channel is absolutely phenomenal when using the Spark Booster’s fat boost mode. Notes just keep on going, singing into sweet musical feedback, and legato is so simple pull off, just have a noise gate of some sort to help keep it all under control. The Spark Booster’s mid boost really helps your tone cut through the mix. At the lowest gain setting there is still a little crunch created, so it doesn’t really work for proper clean tones. It does help your amp sound like it’s being pushed really hard at lower volumes though. Turn up the gain, and things get dirtier and more raucous, perfect for dirty blues. If you love to play thrash metal or so-cal style punk rock then you are going to love the mid boost mode on the dirty channel. With the gain turned right down, and the rest of the controls at 12 o’clock the Spark Booster generates awesome cutting rhythm guitar tones, perfect for the aforementioned styles of music. Keep increasing the gain, and more dirt and saturation is on tap. The real icing on the cake though is the active bass and treble controls. These really allow you to shape your tone perfectly when using the Spark Booster. They are subtle enough to not drastically alter your base tone, but rather sweeten what you already have. Design-wise the Spark Booster is as rugged and extremely well designed. The battery compartment has a very cool design that should never wear out. Just use your pick to unscrew and screw the lid back on. All switches, jacks and controls feel super heavy-duty, and should last through all the bumps that the Spark Booster may go through. Overall the TC Electronic is a very impressive pedal. Not only does it work fantastically as a boost pedal, it really excels at over-driving clean and dirty tones to perfection. The Spark Booster truly is the perfect pedal for every players arsenal, no matter what style of music you play. 2 Responses to "TC Electronic Spark Booster – review"
How about with a bass guitar? Does it loose any bottom end? Sorry, I don’t have any bass guitars on hand to test with. I’d doubt it would lose any low end, considering the pedal has some great active tone controls.